Someone was nice enough to let us know the name of this moose is Tooki. 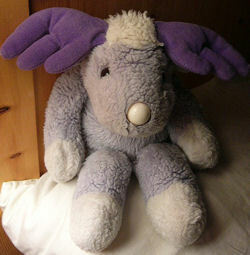 My sister lost her childhood GUND purple moose. (I think it was made in 1989). Can you please find it, and we will buy it from you. Please be sure you use an email address that is correct, and that you will be using for a long time!! I can’t help you if I can’t contact you!! I’m sure your encouragement helps, plus it affirms that people are looking at the request. Thanks for stopping by! !